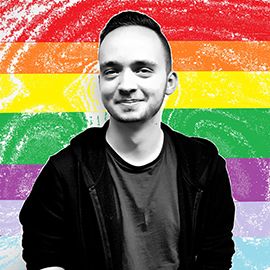 As February is LGBT History Month, we chat to James Dixon, a year 3 mental health student. Redditch, a town just south of Birmingham. What was your experience of growing up there? Well I wouldn’t say my upbringing is what you might class as normal. At the age of 4 I was placed into foster care and have been fostered ever since by my Nan. We moved to Redditch in 2004 and I had a very happy upbringing there with a great support network from both family and friends. When did you decide on a career in mental health nursing? From a young age I have always wanted to work within the NHS, but I was never quite sure where. I had looked at various career options when growing up, but when I attended Bangor University’s Open Day I stumbled across Mental Health Nursing. After listening to the talk about what would be involved I knew this was the area in which I was destined to work. I had been to view various universities and didn’t get a feel for any of them. At Bangor Open Day I stepped off the train and fell in love with Bangor and knew it was the place I wanted to study and live. Have you felt able to be yourself whilst studying and living here? Most definitely. Living and studying here has enabled me to discover who I am as a person and develop into the independent individual I am now whilst studying for one of the most rewarding careers I know. Many LGBT individuals struggle with mental health, why do you think this is? This can be down to many different issues for example they may be aware of their sexual orientation but are struggling to come out to family and friends. There is still also a lot of stigma around the LGBT community, which can result in a struggle due to the fear of hate crime and discrimination from those that they encounter. There is also a fear for some that their sexual orientation will affect their future dreams and life choices. Having now lived and studied in and around Bangor I have found that it’s a community supportive of the LGBT community with a society within the university where individuals can meet up and take part in various activities. These are also open to the wider university group to broaden their understandings around the topic of the LGBT community. As well as this there are also LGBT pubs and clubs which are a good night out and visited by all orientations. All of my placements have been very supportive of the LGBT community - not only this but all staff on an individual level that I have encountered have again been very supportive. What have you enjoyed about being a student nurse? I have loved every minute of the last 3 years - if anything, they have gone way too fast. It has been challenging at times but going out on placement and being able to apply what we have been taught makes it all worth it. Have you changed at all since starting the course? When I approached my close friends with this question they said I have matured into a reliable, approachable, trustworthy, caring and ambitious individual who is willing to work hard. They said I have become more confident and comfortable within myself both in my personal life and my professional practice. Friends have also commented on how I am more likely to have the courage now to just go and do things compared to when I first started, one friend also commented on how I am less nervous now in new situations and meeting new people compared to how I was when I first started the course. My career ambitions are firstly to gain employment as a Mental Health Nurse, and with experience eventually progress up to a Band 6 with a view to doing a master’s degree part time alongside working, hopefully ending up as an Advanced Nurse Practitioner. In years to come I would love to emigrate to New Zealand in order to continue nursing. In my spare time I have joined the Bangor University Dance Society taking part in the Irish Dancing classes. This is a passion that I have had from the age of 7. During my time dancing I have made it to the All Ireland’s Competition and the World Championships, placing in the top 3 at both events. What would you say to student nurses who are struggling?